Iraq, I think, need to pick up a real dictionary and lookup the word corruption. The US dictionary, as we know it, is load of crap. Any queues who will be ‘eventually’ getting this $4.2bn? This answer is in the ‘$’. 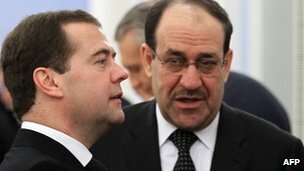 when Maliki returned from his trip to Russia, he had some suspicions of corruption, so he decided to review the whole deal. “As soon as the deal was announced a month ago I said that the US would not allow Iraq to buy such huge quantities of weapons from Russia. I believe Washington regarded this as an absolutely unacceptable scenario,” he said. Iraqi puppet government taking the moral high ground.